Learn to interpret and see the subject in a new and interesting way, one that is based on using the basic elements of visual language. This workshop is for those artists who are interested in not only enhancing their painting skills, but also in understanding how one can approach a painting in a more creative way. Although we will be working from live models, the information in this workshop is applicable to any subject matter. There will be demonstrations, a slide presentation, and as much individual attention as possible. Instruction will be in oils and the class is primarily for the intermediate to advanced painter. Originally from the Chicago area, Carolyn Anderson attended school at Illinois State University. She has lived in northern Montana near Havre, Montana for many years. She is a member of the Northwest Rendezvous and a Master Artist with the American Impressionist Society. Anderson has developed her own singular style, learning from other artists who inspired her, but experimenting with the boundaries of traditional techniques. 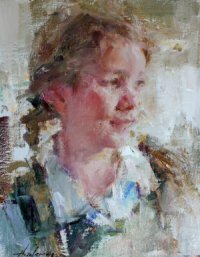 Over the years, she has received numerous awards for her paintings, including twice winning the C. M. Russell Museum Auction Best of Show, several Master Awards of Excellence at the American Impressionist Society show, and several NWR awards, among others. Her paintings have been featured in numerous publications, including Southwest Art, Art of the West, The Big Sky Journal, Fine Art Connoisseur, PleinAir, and American Artist. Anderson has acquired an excellent reputation as an instructor and is known for her lectures on perception and visual language. She has taught for the Fechin School, Scottsdale Artists’ School, the Frye Museum, and Walt Disney Imagineering.